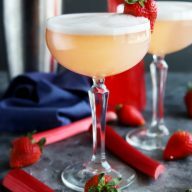 Blood Orange Moscow Mule is a fruity fall twist on the classic cocktail. Now that blood oranges are briefly gracing us with their presence, get in on the goodness in every way possible! Blood oranges are a bit fleeting here in Colorado. They come in and like a tornado, they are gone seemingly moments after they get here. I’m pretty sure it’s all those foodies lurking around, just waiting for them to hit the product section so they can hoard them all to themselves. Let me tell you, finding them was a massive pain – a much larger pain than I thought it was going to be when I initially thought about doing this recipe. 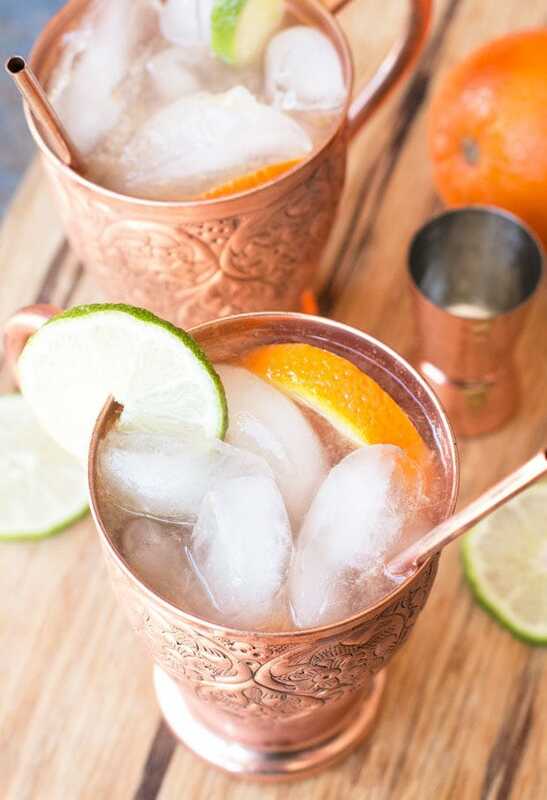 I almost resorted to blood orange vodka (which 100% works as a substitute if you don’t have blood oranges in your area, by the way – trust me, I tried it), but I really wanted the freshest flavor possible in these Moscow mules. You all know that I have an affinity for Moscow mules on Cake ‘n Knife. I love making seasonal variations any chance I get (hiiiiiiii obsession with ginger beer…). 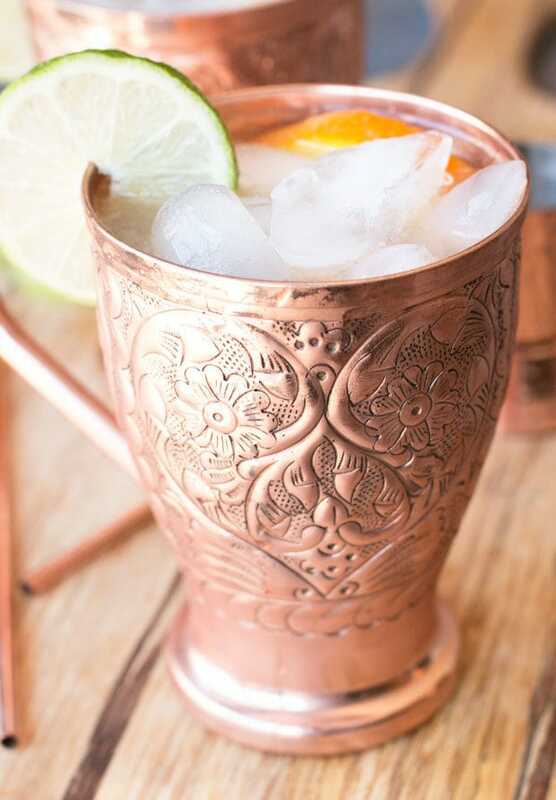 This time I’m bringing something a little extra to the party… New stunning Moscow mule mugs! I mean just look at these… aren’t they gorgeous?! I’m so used to seeing the plain ol’ hammered or smooth copper mugs – I never realized there were such pretty ones out there! 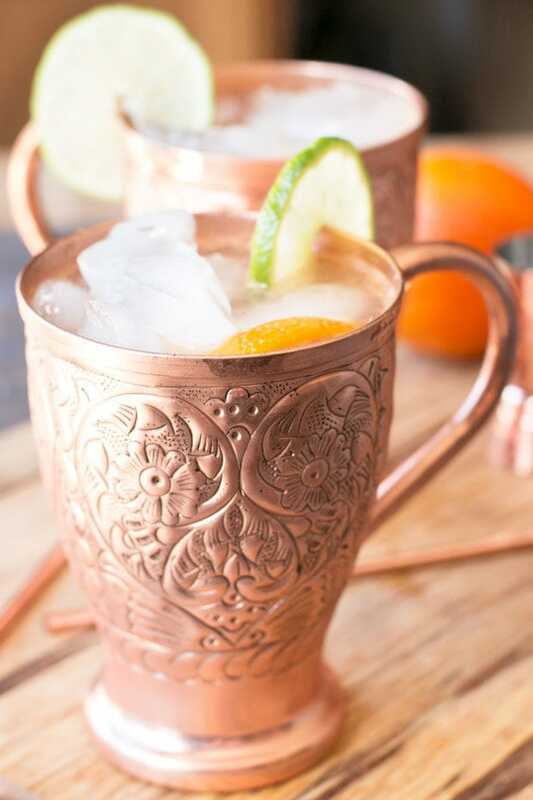 These Kajamo Mule mugs are 100% copper just like the mugs you know and love, but they have an eye-catching design AND they are 16 oz. Yea, you read that right. Now you can make 16 OUNCES worth of Moscow mule deliciousness without having to go back for multiple refills. I’m lucky enough to be giving away a pair of these mugs (copper stirring sticks included!) today! The giveaway is below the recipe, so be sure to enter ASAP. You NEED these mugs to make it through the rest of blood orange season! Disclosure: I received compensation from KamojoMule as part of this giveaway and post. As always, all opinions and recipe are my own. Thanks for supporting the brands that support Cake ‘n Knife! Blood orange is an amazing pairing with the ginger! 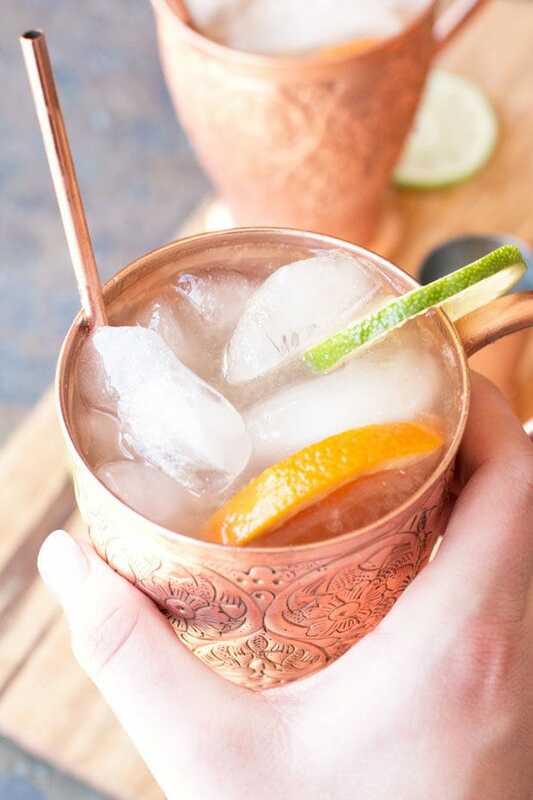 In the bottom of a copper mug, muddle together blood orange wheels, vodka and lime juice. Fill the glass with ice and top with ginger beer. 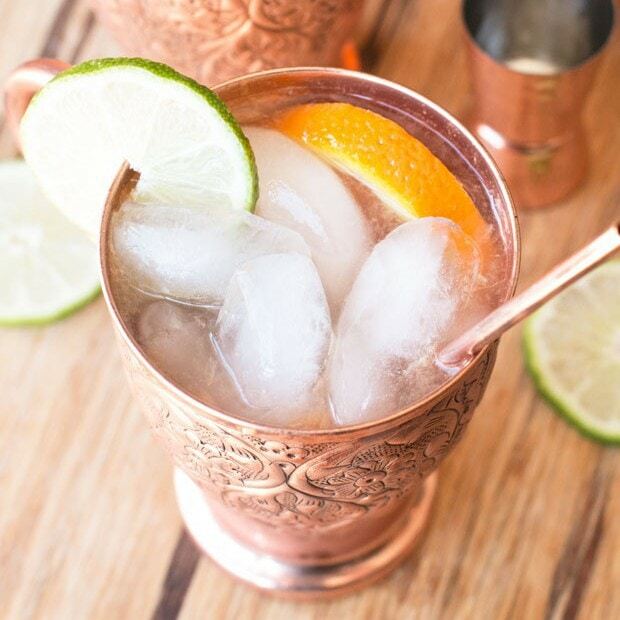 Pin this Blood Orange Moscow Mule recipe for later! What a great idea for Moscow mule with Blood orange! I cant wait to try it in those cool Kamojomule Mugs ! I would make a kiwi mule. But this looks great! i found one called a garden mule with blueberries, lime, cucumber, and mint and it sounds delicious! Since I’ve never made one, I think I’d start with your recipe! I would start with making an original recipe since it’s hard finding blood orange…my mom had one for her birthday and loved it so I would like to re-create it in these beautiful mugs! Fresh ginger and maybe persimmon if I could find one on sale! i would mske a bluebrry lime mule. its my own rreations. I’d make an Apple Cider Moscow Mule. Never made one, so will go with something with oranges in it. 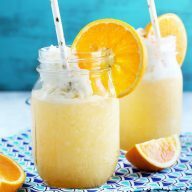 I have never made one but an Orange Moscow Mule sounds great! I’d love to make a Cranberry Apple Mule. This one for sure, love blood orange! I would love to try the Blackberyy Moscow Mule. What gorgeous mugs! Not sure what type of mule I’d make first, but these mugs and stirrers will always make it look good! I would have to try your Blood Orange Moscow Mule recipe first. Sounds good! I love a traditional moskow mule. These Kamojomule mugs are too cute! Thanks for this! I would make the traditional mule since that is what I am the most familiar with, but I would love to try some of these other varities! I would make an Irish Mule. 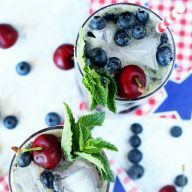 This is my first time with any of this mule making lol so I would take a page from your book and try this recipe! These mugs are gorgeous! Traditional Moscow mule of course!! The first one I’d make is a classic moscow mule with just vodka, ginger beer, and lime. Then I’d start getting creative after that.